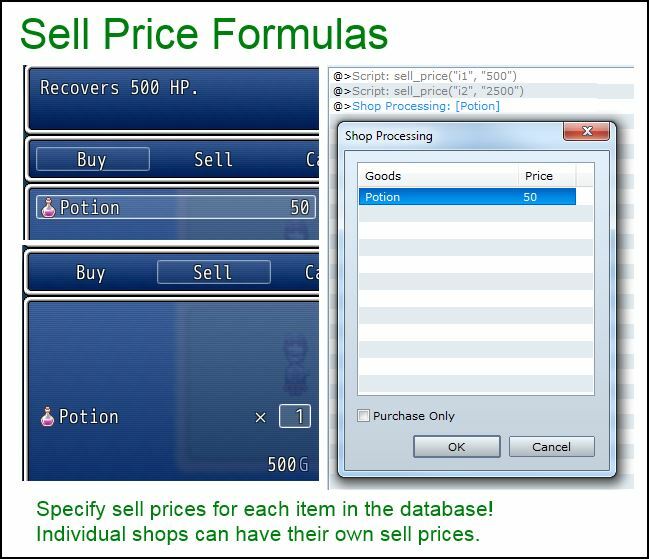 The Shop Manager has been updated to support custom sell price formulas for a shop. By default, the selling price of an item is equal to half the buying price of the good at the shop. This new feature allows you to separate the selling price from the buying price using simple script calls. The formula supports all of the variables that the other shop options support, allowing you to create custom and dynamic shop prices to suit your needs. Seriously, why wasn’t this remade for RPG Maker MV like all the other RGSS3 scripts? The MV Shop Manager doesn’t have this functionality. Why was this not included? This script was so easy: just use a script call and voila, you can sell back all of your items at exorbitant rates, finally taking revenge upon all the Tom Nooks of the world. Just remake this as a plugin for MV Tsukihime, the world needs this! Hi. Maybe I’m just too much of a dweeb to figure it out, but what I’d like to do is set a price difference for -all- of the goods in a shop. Like, when variable x >= 10 I can set up a certain shop to give an additional 10% for any items sold. Is that possible, and what would the formula be? Would it have to be done for each individual item? I would like this to work with a sell only shop. When I select the “purchase all” option, I’m not really creating an item list to draw from. How would I make the script call? I previously tried sell_price( , “*.110”), and it gave me an error. Yes, you would need to specify the price for each item individually since the shop manager does not support shop-wide properties (eg: 10% discount/bonus on all items). For sell-only shop, the sell price is treated as the buy price in this case, so you would need to use price_good, but it doesn’t support referencing the original price stored in the database. Do you plan to make it so that a shop can has stock? But crap, sell and buy prices? Darn, now I can&apos;t pick! I do have a shop stock script but it was mainly a test. At some point I would like to implement a proper one but graphics will still be an issue because the default shop window doesn&apos;t really have any room for that kind of stuff. Did you see Galv&apos;s or http://yanflychannel.wordpress.com/2012/02/15/yea-shop-options/ Yanfly&apos;s? I saw Galv&apos;s, but I don&apos;t see any shop stock for yanfly&apos;s.